Cinnamon Apple Pie Cake is absolutely yummy! I’ve served it multiple times with great reviews and requests for future events. This is a definite favorite in my recipe box! Preheat the oven to 350 degrees F. Spray a 9 1/2 to 10-inch springform pan with nonstick spray. Line the bottom with a round of parchment paper and then spray again. Layer the apple slices in the pan until they come about 2/3 of the way up the side. (I went a little higher than that and it worked out fine). Sprinkle the cinnamon-sugar over the apples. Prepare the batter by beating the eggs and sugar until light and fluffy. Add the oil (see notes below about the amount of oil called for) and the vanilla and beat well, then stir in the flour. Pour the batter on top of the apples, and sprinkle with additional cinnamon-sugar. Tap the pan on the counter a few times to allow the batter to sink down and around the apples. Bake for 1 hour and 20 minutes, or until a skewer inserted into the center of the cake comes out clean. Cool *completely* in the pan. If you try to remove the cake from the pan while it is still warm, it will tend to break apart. I refrigerated my cake before slicing, and that worked out well. Serve slices with ice cream (warm individual slices in the microwave, if desired). You want “caster sugar” for this recipe: It is a finer grind than table sugar, but not as fine as powdered. Look for “Baker’s Sugar” at the store, or simply put regular white sugar in your food processor and give it a few whirls to create superfine sugar. NOTE: In the original recipe from this cookbook, the author calls for 1 1/2 cups of oil. Although my pie cake turned out just fine the way the recipe was written, when I make it again… I will definitely try using 3/4 cup oil and 3/4 cup applesauce instead. Some readers have noted that this has worked well for them. My Mother was such a great cook and many of my cherished recipes came from her kitchen. Apple Roll Ups is one of those recipes. They are fantastic served warm but equally good left-over. 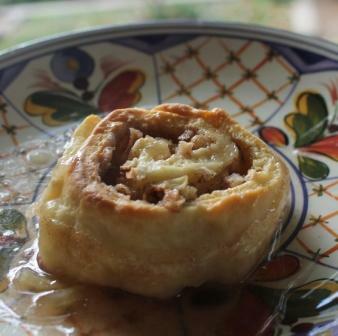 If you truly want to indulge, you can pour a bit of cream on the top of your Apple Roll. Boil for 3 minutes. Cool. Pour into ungreased 9×13 inch pan. Combine flour, baking powder, salt and shortening and blend well. Add 1/2 up milk and 1 egg. Mix well. Roll the dough out on a floured surface into a rectangle shape about 1/4-1/2 inch thick. Sprinkle sugar and cinnamon over rolled out dough. Add chopped apple. Roll up carefully and cut into 12 in slices. Place in 9×13 inch pan on top of cooled syrup. Gluten-free eating means I rarely eat toast, breakfast pastry, etc. Sometimes, I just need a carb ‘fix’ and this recipe sounded delicious. I slightly altered the original recipe and loved the results. The second time I made this recipe, I substituted blueberries for the craisins and baked in muffin paper/tins. I’ve shared both versions with good feedback. I’ll even admit that I didn’t eat all of it soon enough and the last piece was a bit dry. I thought, ‘why not put almond milk on it?’ like a bowl of oatmeal. It was delicious. A new favorite for my gluten-free recipe box! Soak the oats in the almond milk in the refrigerator overnight. In the morning, combine all ingredients. Spread in greased 9-inch pie plate (or muffin tins). I love a good sandwich and when I spotted the word BRIE, I was sold. I’m a sucker for wonderful cheeses and I decided it was worth the gluten treat to try it. It was a wonderful sandwich although, as always, I wondered what it would be like if I added a nice jam to it. Next time…I’m adding a raspberry jam…mmmm, can’t wait! Preheat a skillet over medium heat. Lightly brush 1 side of each slice of bread with olive oil. Place 1 slice of bread, olive oil-side down, into skillet. Arrange apple slices evenly over bread. 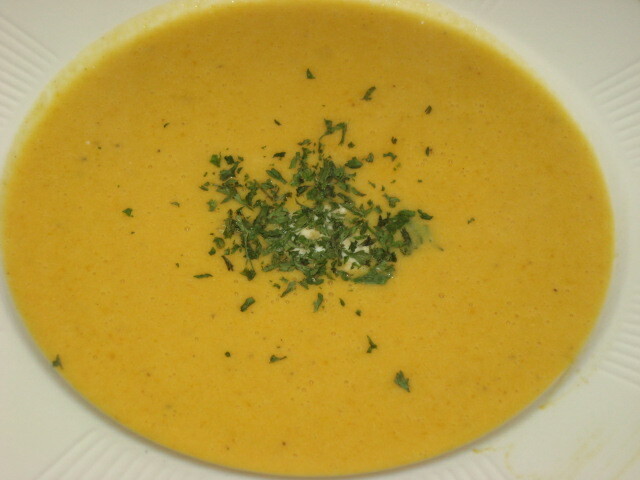 Layer with cheese and top with remaining slice of bread, olive oil side up. Cook, until bread is golden brown and the cheese has melted. Recently our book club read and reviewed ‘Tallgrass’ by Sandra Dallas, a historical novel that addresses the life and times of the small Colorado town and the controversial internment camp that divided the townspeople. It was an great book and spurred an excellent discussion. We all agreed that Sandra Dallas, who lives in Colorado and has family ties to Iowa, has an excellent voice for her characters. Our book club always begins our gathering with a wonderful potluck typically with a theme associated with book. This evening we enjoyed sushi, edemame salad, fried rice, salads, fruit and much more. After brainstorming with my book club buddies, I decided to make an Old Fashioned Apple Pie in honor of Mary Stroud, a key character in the book. My favorite Apple Pie is, again, from one my all-time favorite cookbooks. I must confess that I don’t make my own pie crust. I think the Pillsbury Refrigerated Pie Crusts are excellent and I’d rather spend time on the good part…the filling! As I was making this pie and cutting the vents for the top crust, I couldn’t help but think of my Mother and the hundreds, if not thousands, of pies that she baked over the years. I carry on her vent design, simple but effective. The pie is excellent on its own but always wonderful topped with vanilla bean ice cream, too! On lightly floured surface, roll out half of pastry into an 11 inch circle. Use to line 9 inch pie plate, trim. Refrigerate, with rest of pastry until ready to use. In small bowl, combine sugar, cinnamon, flour and salt, mixing well. Add to apples in large bowl, tossing lightly to combine. Turn into pastry-lined pie plate, mounding high in center; dot with butter. Roll out remaining pastry into an 11 inch circle. Make several slits near center for steam vents; adjust over filling; trim. Fold edge of top crust under bottom crust; press together with fingertips. Crimp edge decoratively. Bake 45-50 minutes, or until apples are tender and crust is golden-brown. Cool partially on wire rack; serve warm. Optional: Top with vanilla bean ice cream. Autumn inspires me to bake, especially the traditional Apple Pie. Don’t get me wrong, I love traditional, 2 crust apple pie but I LOVE a Dutch Apple pie with its delectable crunchy topping. This recipe, from McCall’s Cook Book 1963 has been in my recipe box for a L-O-N-G time and always a winner. It’s a crowd-pleaser and the aroma of the baking pie fills the house with baked love! Prepare pie shell; refrigerate until used. Make Topping: Combine flour and sugar in medium-sized bowl. 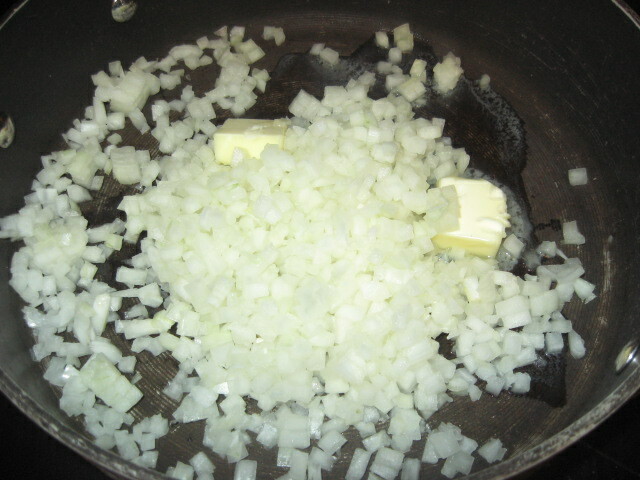 Cut in butter, with pastry blender or 2 knives, until mixture is consistency of coarse cornmeal. Refrigerate. Make Filling: Core apples, and pare; thinly slice into large bowl. Sprinkle with lemon juice. Combine flour, sugar, salt and cinnamon,mixing well. Toss lightly with apples. Turn filling into unbaked pie shell, spreading evenly. Cover with topping. Bake 40-45 minutes or until apples are tender. Fresh Cranberry Relish for your Thanksgiving Feast! Cranberry relish is Thanksgiving tradition. My Mother always served fresh cranberry relish and I have continue the tradition. The relish is tart and crisp, a nice contrast to the savory turkey, gravy, and dressing. If you prefer a sweeter relish, add more sugar to taste. 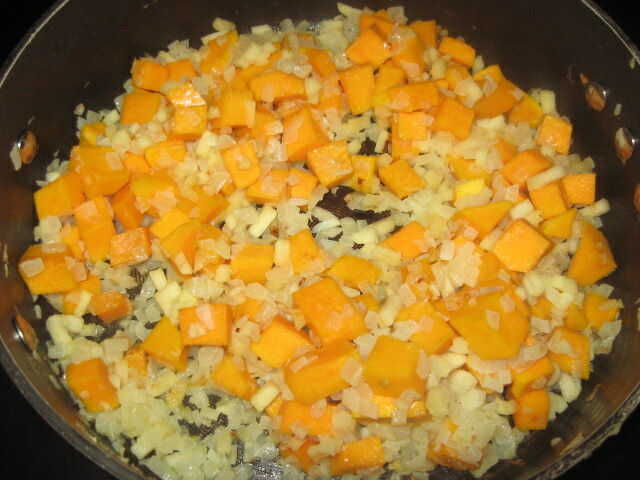 As I prepare the relish, I wondered how my Mother chopped the ingredients without our Food Processors and the I remembered…she used the cast iron food grinder…which I still have. It worked beautifully AND helped build those arm muscles. If only I had a place to attach the grinder so I could use it! This Thanksgiving, as always, be thankful for our families, our health, our friends and that we have the joy of sharing Thanksgiving with loved ones! A day or two before serving, rinse the cranberries. Remove any soft or blemished cranberries. Wash and core red apple and chop into large chunks. Wash and halve and orange. Remove white membranes and slice off top and bottom peel of orange. Chop into large chunks. Place cranberries, apple, orange and sugar in food processor and chop until coarsely ground. Chill for a day or more and serve. Great with the Thanksgiving turkey. 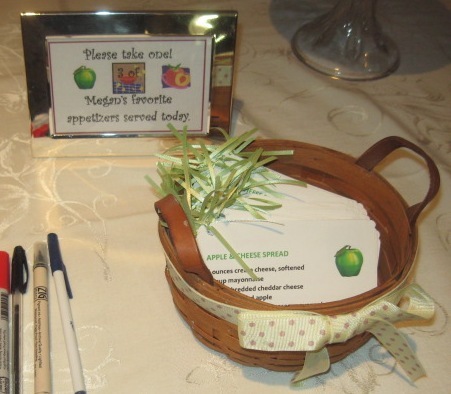 Food Themed Bridal Shower … Cheesy Apple Spread is recipe number 1! It seems my world truly revolves around food, as it does for my daughters! Our oldest daughter, Megan, was married last year; we asked bridal shower guests to share a favorite recipe to insert in a cookbook. This year daughter, Sarah, is also engaged and we did the same for her shower. I photocopied hand-written recipes of Grandmothers, Great-Grandmothers, and other family members no longer with us. We also asked each guest to write a note the bride inside the cookbook. As favors, we gave each guest a copy of three of Megan’s favorite dip/spread recipes which we also served at the shower. The dips shared were Cheesy Apple Spread (today’s post), Hot Wing Dip, and Peach Salsa. They are all family favorites. 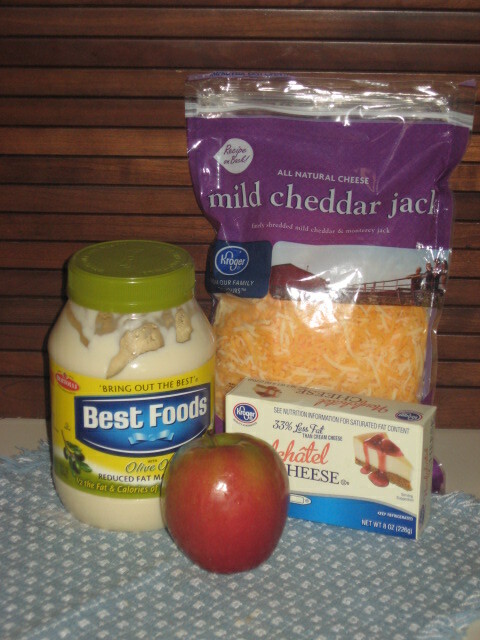 The Cheesy Apple Spread recipe has been in my recipe box for at least 30 years. 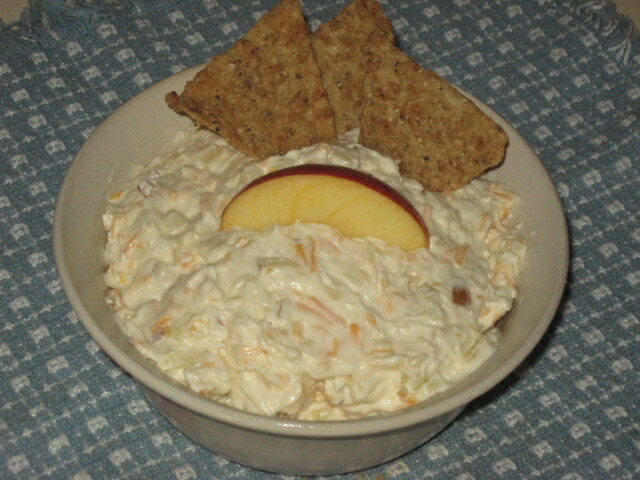 Younger daughter, Sarah, loves this dip as well and prepared the dip for the shower. Cheesy Apple Spread is truly an oldie but still a goodie! Blend together the cream cheese and mayonnaise. Add shredded cheese and chopped apple. Chill until ready to serve with Ritz or other favorite crackers. Apples were plentiful in the Iowa countryside growing up. My Mother would also can or freeze apples for use during the year. 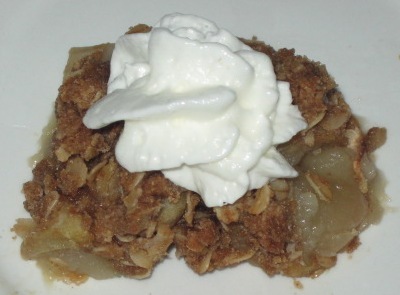 This is a simple, country Apple Crisp that is easy to make any time of year. Dallop with a little whipped cream and enjoy. 1. Peel, core and slice apples. Place in greased baking dish with a bit of water. 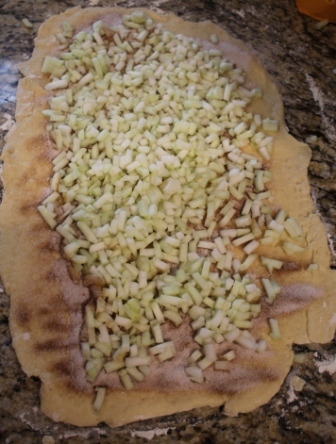 Combine dry ingredients, add melted margarine, mixing until crumbly; sprinkle on top of apples. 2. 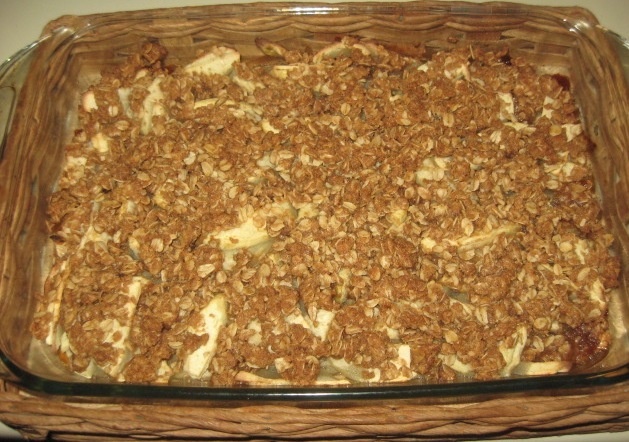 Bake in preheated moderate oven (375 degrees) for 30 minutes or until apples are tender. 3. Serve warm or cold with your favorite ice cream or topping.